It’s a privilege to have worked with the talented Sharon Silverman, as one of the pattern contributors for her book “Delicate Crochet”. The freshly published “Delicate Crochet” contains 23 light and airy crochet designs, including my Cyndi Floral Lace Skirt, to tickle your crochet fancy. Pattern contributors include Vashti Braha, Jude Butterworth, Robyn Chachula, Rhonda Davis, Karen McKenna, Marty Miller, Katya Novikova, Kristin Omdahl, and Amy Solovay, known for their innovative, gorgeous crochet designs. The new book is now available from Amazon.com and Amazon.ca, so do check it out and get yourself a copy of this beautiful book. To find out how to win a free copy of “Delicate Crochet” (and other fabulous prizes), please join my Winter Accessories KCAL ( Jan 1 – Feb 11) and visit the CHAT—Winter Accessories KCAL Jan 1-Feb 11 2019 thread for more details. This entry was posted in Milestones, News or Events on December 15, 2018 by Vicky Chan Designs. I’m really excited that the Vogue Knitting Spring/Summer 2018 issue has finally published because Lee Ann Dalton of Vogue Knitting has written an article about me and my designs. To see the extent of my excitement, imagine me in a grocery store frantically waving the magazine at my husband from far away, while he was at the ice-cream aisle deciding which flavour to buy (edited out as someone complained that it was fictitious) and wasn’t aware at all that I was hunting him down from aisle to aisle after stalling at the magazine stands. Beyond the excitement, it’s an honour to be profiled in Vogue Knitting by Lee Ann. This issue also has a very nice collection of beautiful patterns. If you are interested to learn more, please check it out at your local magazine stands or from http://vogueknitting.com/magazine. You can find Lee Ann’s delightful article in her “KNIT LIFE: Canada” column. Lee Ann, thanks for the wonderful article! It will be a treasured memento for me. This entry was posted in Milestones, News or Events on May 12, 2018 by Vicky Chan Designs. Today I have accumulated 10000 hearts at Ravelry for my design Jordan, since the 5000 hearts milestone on August 3, 2015 . This is one of my favourite designs, and I have crocheted another Jordan in early January (with Euroflax Sport to replaced the discontinued Allegoro). Each heart means an additional special encouragement to me as I continue to design. Thank you so much to all of you for your kind support! This entry was posted in Milestones and tagged crochet design, crochet pattern, crochet pineapple lace, Jordan, pineapple tank, pineapple tunic, Vicky Chan, vicky chan design, Vicky Chan Designs on March 30, 2018 by Vicky Chan Designs. 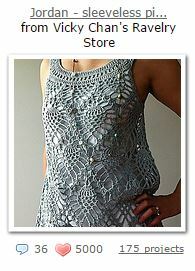 To learn more about the Jamie vest and to purchase, please find it here at my Ravelry Store. This entry was posted in Milestones on August 16, 2016 by Vicky Chan Designs. I’ve been checking my mail almost everyday for the last couple of weeks. Finally, my copy of the newly published “Crochet One-Skein Wonders for Babies” is in the mailbox today. I still haven’t got over the excitement — the short sleeve version of my Gina floral lace baby/child cardigan is in the book, beautifully illustrated on page 123. It’s absolutely delightful to see the cardigan looking so adorable on the little cute model. To learn more about the Gina pattern and to purchase a downloadable version with full 5 sizes, please find it here at my Ravelry Store. This entry was posted in Milestones, News or Events on May 31, 2016 by Vicky Chan Designs. I’m honoured and delighted that the All Wound Up Yarn Shop in Edmonds, Washington is holding a Crochet Along (CAL) for my Ava – lacy shells cardigan pattern. The yarn shop is opened by Leslie and her daughter Nona nearly one year ago. Their beautiful store sample is shown in the picture below. For details about the CAL, please check out their store web site here. To learn more about the Ava cardigan and to purchase, please find it here at my Ravelry Store. This entry was posted in Milestones, News or Events on May 7, 2016 by Vicky Chan Designs.